Whata Buz and Zinnobar won the two major events at the racetrack, yesterday. The top attractions were a Premier Class race and a flat race which formed part of the 50th meeting this year. Sixteen horses took part in the Premier Class race. Newcomer Whata Buz (Noel Baldac-chino) was the fastest at first, opening a slight lead from P.A. Surprise (Lorraine Cunningham) and Zalgado Transs R (Nicholas Bonello). Whata Buz retained the leading position for its first win at Marsa, a length in front of favourite Vasterbo Paradise (Claudio Re-falo). P.A. Surprise and Wiss Rambo (Rodney Gatt) followed home in that order. American Whata Buz clocked an average time of 1.15.2” per kilometre. As expected, English mare Zinnobar (Michael Sultana) went unchallenged during the 1,250m distance in the only flat race in programme. Zinnobar secured its second win in a row, some three lengths in front of Gold As Good (George Falzon) and Key Art (Sarah Borg). Only five horses took part in this race. Yesterday’s programme also included eight other trotting races. In a Gold Class race, early leader Starfirefinnfemfel (Dylan Gatt) ran out of steam around 300m from the finishing line. In the final straight the Swedish trotter was overtaken by Sigurd Speed (Mario Fenech) which gained its first win at the racetrack ahead of Wies Buitenzorg (Eric Bezzina) and Radjah De Marzy (Patrick Spiteri). Ramses D’Ariane (Sam Cassar) finished fourth. Under the guidance of one of its owners, Philip Calleja, Ricardo Mols notched its first win in the other Gold race. 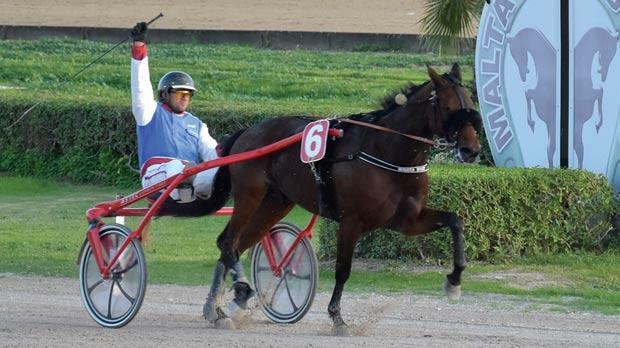 Born in Denmark, Calleja’s trotter hit the front midway through the final straight and raced home ahead of Sensei (Noel Baldacchino) and Peel And Stick (Eugenio Bondin). The next meeting is on Sunday.